Home of New England's ORIGINAL "YOGA with Goats!" 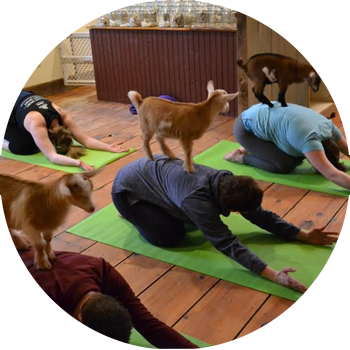 Welcome to Jenness Farm, the FIRST Yoga With Goats Classes in New England (if not the entire East Coast!)! Our classes were featured on countless news media outlets, websites and social media outlets including: The NBS Nightly News With Lester Holt, NH Chronicle, The Dodo, CondeNast Travel, Country Living, David Wolfe, Huffington Post, BBC News....and the list goes on and on! We are the makers of the FINEST Goat Milk Soaps, we handcraft over 80 fragrances of Goat Milk Soaps, Body Care Products, all natural bath & body care products...made by us, right here on the farm in small batches, with all natural ingredients! Browse our line of premium Goat Milk Soaps for sale, and learn more about our Yoga with Goats Classes.